Syrian President Beshar Al-Assad says he is willing to hold parliamentary and presidential elections in Syria and run in those elections, said a Russian official on Sunday, according to AFP. 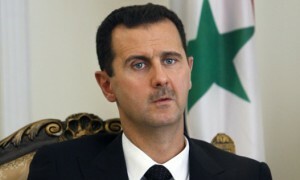 Assad reportedly says he is willing to take part in the elections “if the people are not against it”. Yushenko states that Assad, whom he described as “absolutely sure of himself”, says he is ready to discuss constitutional reform and elections only after the threat of the Islamic State jihadists has been eliminated. The U.S. and Saudi Arabia have consistently called for the resignation of Assad. Russia has insisted that the Syrian people should decide his fate. On Saturday October 24, Russian Foreign Minister Sergey Lavrov said that Russia wants Syria to prepare for presidential and parliamentary elections, stressing that no one should decide Syria’s fate except for its people. He also said Russia is prepared to give air support to Western-backed “patriotic” rebels battling jihadists.